We offer internal and external painting and decorating services. We offer carpentry and plumbing services for private and commercial buildings. We are fully qualified and insured to carry out Reptile Relocation. We pride ourselves in offering the very best services available to our customers throughout the whole of Kent and Sussex. Established in 1994, we pride ourself on our business relationships and reputation, due to this we have attracted many customers through its recommendation alone. Are you a home owner needing property maintenance? Over the years we have formed relationships with clients who require the one off repair jobs to constant home improvements. Have a look at our wide range of services for home owners. Are you a business needing property maintenance? We have developed and maintained professional relationships within the commercial sectors, preforming full refurbishments to ongoing contracts. Have a look at our wide range of services for businesses. You can rely on us to get the job done. We always arrive on time to every job. If we experience a delay we will inform you. We always offer free quotes for our jobs. We can offer quality work at affordable prices. We always put in 100% effort into every job. The areas below are all the areas in which we cover for all the property maintenance services. If your town is not listed below please get in touch as we maybe able to help with your property maintenance and ecology needs. YDM Ltd is a professional and dedicated business specialising in providing customers with highly effective Property Maintenance Services and Ecology Support. 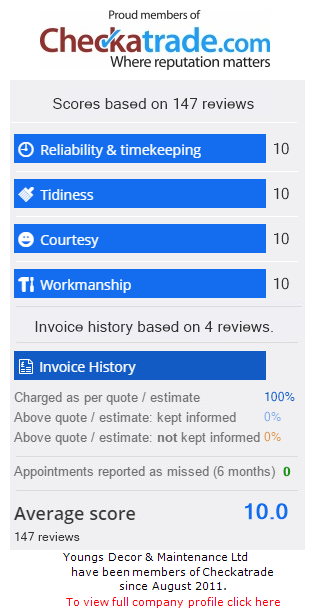 We pride ourselves in offering the very best services available to our customers throughout the whole of Kent and Sussex.